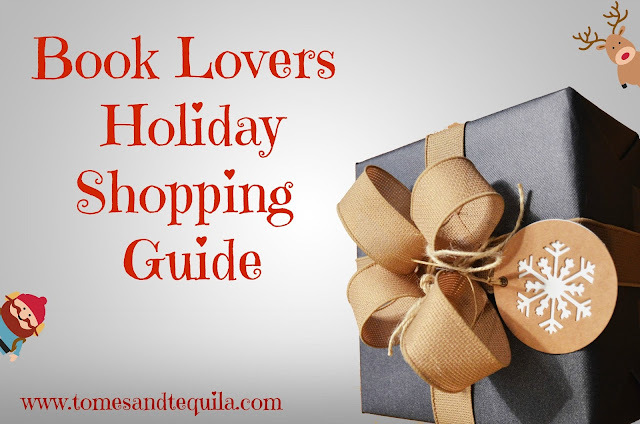 Tis the Season to be jolly, and buy fabulous gifts for all of your book loving friends!! I LOVE buying gifts and thoroughly enjoy hunting online for the perfect gift to give to my people. Christmas is my favorite time of the year, and since my life is filled with book lovers, I figured now was the time to share with y'all yet again another of my gift giving guides! We are running out of time, and I know ordering from someplace like Etsy means a little longer shipping time normally...but I enjoy supporting a small business or person more than a big box store. Plus I like buying a little more unique pieces...something not everyone else is going to have. So here are a few things I've found that would be perfect for the book lover in your life!! 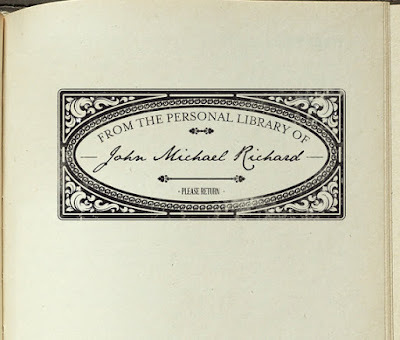 I have a mad lust for this book stamp. I have come across a few beauties before, but this one takes the cake! Starting at $34.95 from BARNSTATIONERY it would ensure the books you hold dear and lend out make their way back into your arms. I don't know of many book lovers who wouldn't appreciate a beautiful customized self-inking stamp for their library. 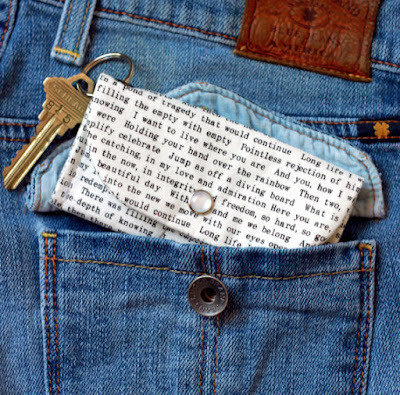 Okay, this Book Lover Keychain/Wallet is one I already own and wield daily. I use it at work to hold my work keys, my ID Card, and I even tuck my nametag in it (when it's not on)...so all of my important work stuff is in one place. It's small enough to keep in my pocket, and looks much cooler than that hard plastic tag hanging off a lanyard around my neck! It is $19.99 over at CrookedSmileCreation. 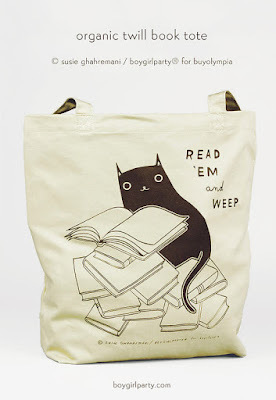 Okay this tote bag will satisfy both the book and cat lover on your shopping list...and you can never have enough tote bags in my opinion! For $24.99 over at boygirlparty you can buy a cute tote to fill with a few favorite books, a bottle of wine and a candle for the perfect gift for a friend/coworker/favorite neighbor! 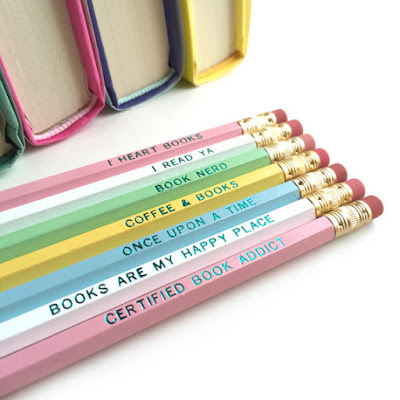 I think this pencil set is so cute, in pretty pastel colors with bookish phrases...perfect for the teen reader in your life. Well, who am I kidding...I would keep them on my desk too. With cute sayings like Books Are My Happy Place and Book Nerd, at $13.95 from IceyDesigns these are a steal, and would look cute in a pencil bag or sticking out of a coffee mug. 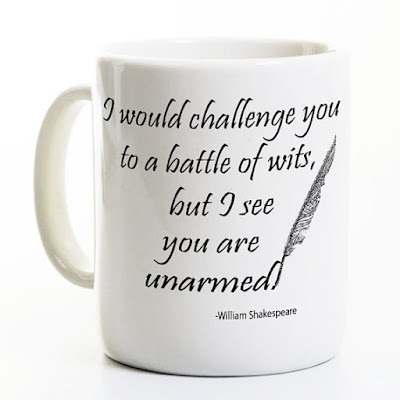 Okay, maybe not this mug...but I am a HUGE Shakespeare fan, and I almost bought this one for my daughter for her birthday (instead I went with this Scrubs mug). This is for the reader in your life who you would also consider buying the Tyrion Lannister quote goodies. It would look perfect on my husband's desk. It starts at $13.99 over at perksandrecreation. This particular gift idea is tailored for me as it's a beautiful C! 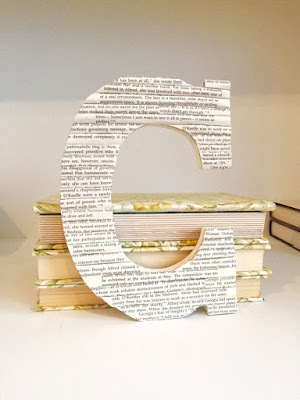 As I've said before, everyone loves a personalized gift, and this would look terrific on a desk or a bookshelf surrounded by other beautiful bookish items (or even...books!!). I have had my eye on it for ages, as I can just see it in photos next to my books. You can find it at ArtfulLibrary for $35. These book Kindle covers are absolutely gorgeous. If you click through to the page you'll see that the interiors are as stunning as the exteriors, and my favorites are totally Jane Eyre and The Great Gatsby. What a terrific way of showing off your personality and love of classic books! 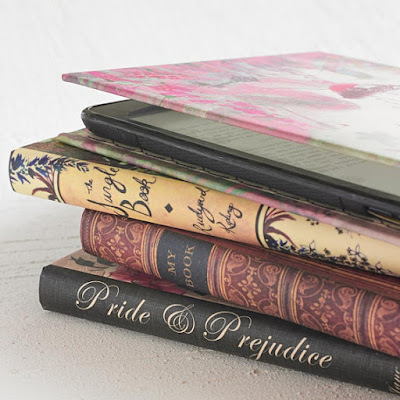 I have always enjoyed picking out Kindle Covers...but these are by far the prettiest I've ever found. You can get them from KleverCase for $32.24+. 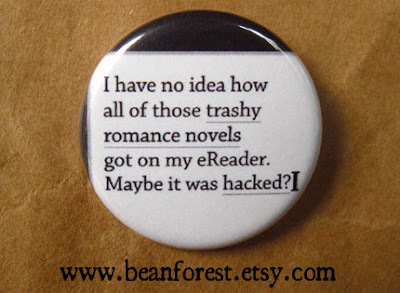 Okay, I may have a specific person in mind with this one (*cough* KAT *cough*) but I think this button/magnet is the perfect cute little gift to give to the romance reader in your life. Personally I know too many apologetic romance readers...own it, girlfriends! For $1.50+ at beanforest you can help your friend take her first step in letting her romantic-freak flag fly! 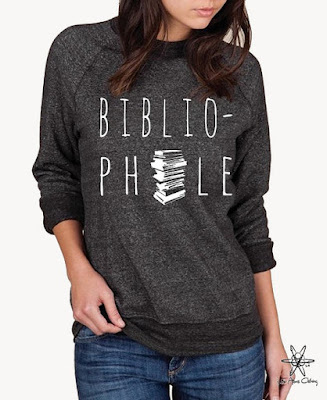 This cute Bibliophile Shirt is nice enough to actually be worn outside the house. I don't think there's a whole lot more I need to say after that! It's pretty...would look great with some dark jeans and boots! LOL I'm a book blogger, and not a fashion blogger though. You can find it on LittleAtoms starting at $34. Okay, I'm a walking talking advert for Libraries. I have always loved libraries, and I love them even more now that I work in one. My husband gives me a hard time for talking about work all the time at social gatherings...but I am PASSIONATE about Libraries. 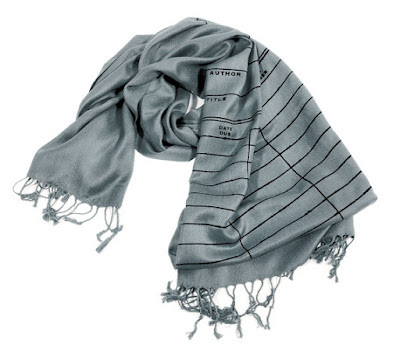 This Library Card Scarf is the perfect gift for someone like me. It's for that friend who checks out the max amount of items possible...who has a tote dedicated to library items. The one who knows the Library Staff by name. For $44 over on Cyberoptix, you can make her very happy. Okay folks, that's all I've got for ya at the moment! We're running out of shopping days before Christmas, but all of these would make great birthday or just because gifts also. So head on over to Etsy and see what you can find. I'm a huge fan, and have shopped there for years. I enjoy receiving items packed with care from a person...most coming with personalized notes of thanks, coupon codes for future purchases, and other little touches that make shopping a tad more special.